On December 16 and 17, 2015 at Fraunhofer FOKUS in Berlin, a kick-off meeting for a new EU project took place. 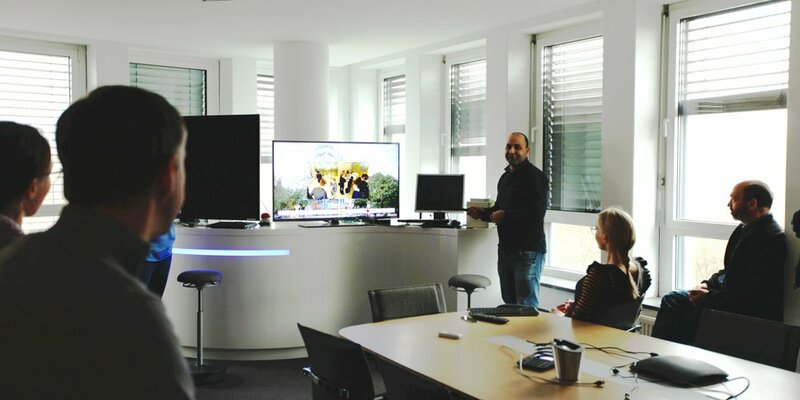 The “Multi-Platform Application Toolkit” (MPAT) is based on the HbbTV Application Toolkit (HAT), which was developed as part of the EU funded PP project FI-content 2. MPAT will develop tools for the simple creation of interactive apps for Smart TVs and Second Screens. Wordpress is used as a web interface that is extensible with templates and plug-ins. As content creators don't need any codings skills while utilizing a common web content creation tool, MPAT enables the fast and cost efficient development of interactive applications. MPAT is funded by the European Union Horizon 2020 programme. Fraunhofer FOKUS Competence Center FAME is the coordinator of the project and collaborates with the Institut für Rundfunktechnik (DE), Rundfunk Berlin-Brandenburg (DE), Lancaster University (UK), Mediaset (IT), Leadin (FI), Fincons (IT) and Telecom ParisTech (FR).